When a group of fourteen Nicaraguan women in La Paz Centro formed a bio-intensive gardening group in the spring of 2014, they decided to call themselves “La Fortaleza” or “Strength.” And strength is what you see when they are throwing picks into the packed volcanic soil or pulling weeds in the blazing sun, as they work in garden beds they developed in one of the five community gardens or one of the patio gardens in La Paz Centro. La Fortaleza is led by a young woman named Elioena Arauz. She comes each week from Matagalpa, a city north of La Paz Centro, to spend three working days with La Fortaleza and with other members of the community. Elioena teaches principles of bio-intensive gardening and nutrition. She got her training in a program led by BioNica, http://bionica.org, learning carbon-intensive methods to develop and maintain soil fertility in the tropics so that the soil is capable of growing crops without synthetic fertilizers, herbicides and pesticides. A central goal of Artists for Soup’s work in Nicaragua is increasing food security,a goal linked to figuring out how to grow teachers as well as food. Artists for Soup has learned from more experienced groups that growing effective teachers requires supporting talented women who can model, engage, inspire, and teach their students. Elioena has been this person for Artists for Soup. “The garden is my teacher,” says Elioena. She also lists many bio-intensivists she admires and speaks of the path God helps her navigate. 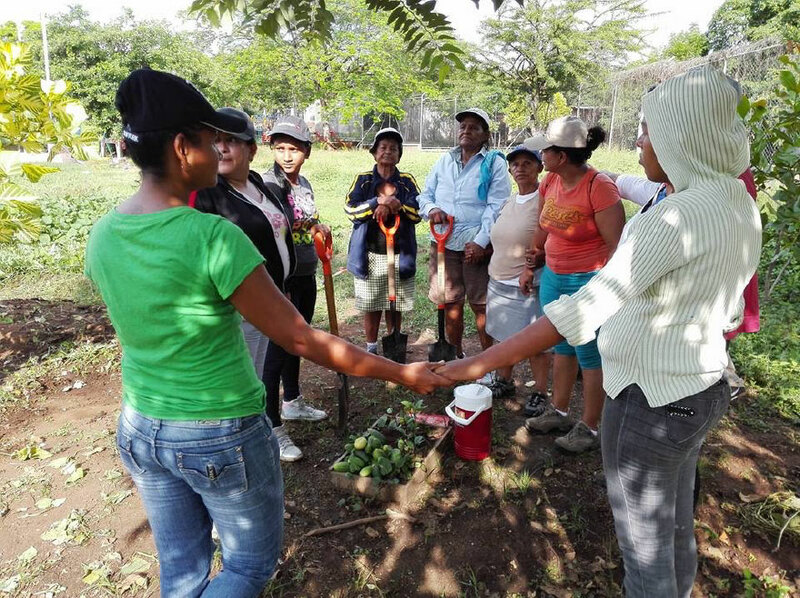 The women of La Fortaleza are becoming teachers of gardening for others in the community, teachers in secondary and primary schools and in churches. They are also starting to save a percentage of funds from a small stipend that Artists for Soup pays them during the monthly development of each new community garden project. The group has agreed to use this shared account toward startingan enterprise that will allow them to have greater economically stability. The women have collectively saved $700 dollars so far and are starting to discuss the possible businesses that could lead to on-going earning. One hope is that this group of teachers will be able to buy their own small plot of land where they can raise organic vegetables to sell to their neighbors.The dream of buying a plot of land for developing a cash-producing organic garden will be more attainable if Artists for Soup is able to match the saving the group has achieved at the New Year. Please consider giving toward this goal of matching La Fortaleza’s shared savings account on January 1, 2017. Any excess raised will go toward supporting stipends paid to La Fortaleza as they bring gardens to new groups in the La Paz Centro community.